In the blue-green haze, a black silhouette emerges in the distance. Swimming closer, the clear form of a green sea turtle begins to take shape. The goal of our self-guided Akumal snorkeling adventure was to encounter these graceful creatures in the wild. The Akumal turtles did not disappoint and it was the highlight of our trip to Mexico. We’re no strangers to encountering see turtles in the wild. We got to see them in the Bahamas in 2006 and again last year in the Galápagos Islands. But we learned that you should never pass up a chance to see sea turtles. And who would want to? Each experience is mesmerizing. While planning our trip to Mexico, we’d heard about swimming with turtles in Akumal and that it could be done in the wild for FREE! But we also saw a lot of pricey tours being offered. Always up for an adventure, we set out to do the snorkel trip our own and will share our secrets with you. As it turns out, you can do your own Akumal snorkeling tour cheaply and easily. We set out from Playa del Carmen a little later than we had expected, arriving at Akumal around 10:45am. In retrospect, we should have gotten there earlier. The layout was pretty obvious, except for figuring out where to access the beach (hint: you go through the dive shop; see instructions below). Snorkeling with turtles in Akumal is easy. The small bay is protected by a reef. Big waves can’t penetrate the bay, so it is perfect for snorkeling. The Akumal sea turtles are plentiful and they’re used to the presence of humans. You can get close to the turtles (while still respecting their space!). As they get used to you, you can appreciate their strong front fins that propel them through the water. As they come up for air, you can look them in the eye and see the strength and grace they project. It’s really pretty amazing. 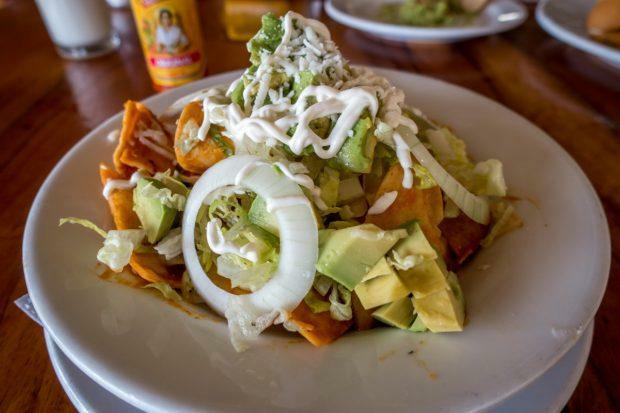 After a couple of hours of snorkeling, we parked ourselves in the Lol-Ha restaurant to enjoy the shade, the view of the ocean, and some amazing lunch delights: chilaquiles and a cochinita pibil torta. There’s something refreshing about food and drink after spending a few hours in the salt water. Our visit to Akumal was a wonderful day in the sun and sea from our base in Playa del Carmen. Of our entire trip in Mexico, snorkeling in Akumal with the sea turtles was the highlight of the trip. The small bay at Akumal has a sandy bottom comprised very fine sand. It gets stirred up as the day goes on, cutting visibility significantly. When the tour groups start arriving in the mid-morning (often with inexperienced snorkelers), the bottom can get stirred up very, very quickly. Therefore, we recommend arriving at Akumal as early in the morning as you can, ideally no later than 9:30am. If you are going with a tour operator and they can’t get you there by 10:30 or 11:00 am, look for someone else. Akumal is located 23 miles (38 km) south of the hotel zones in Playa del Carmen and 65 miles (104 km) south of Cancun. Akumal is about half-way between Playa del Carmen and Tulum (however, we do NOT recommend doing both in the same day). There are several ways to get to Akumal, but there are really only three good ways–rental car, a colectivo (the shared local mini-vans), or a private tour. The easiest and best way is by car. If you’re spending any time in the Yucatan, consider getting a rental car. If you are going to lots of different places (Tulum, the cenotes, Xcaret, etc. ), you’ll ultimately save money with a rental car versus booking tours, and you’ll save time over the colectivos. Rental cars in Mexico are very inexpensive and high quality (we had a brand new Volkswagen Jetta). If going to Akumal beach by rental car, head south and follow the signs for Akumal. The road to the town and beach is on your left (you’ll go past it about 200 yards, take the “returno” back and then make a right down the road to the beach. It’s only about a half-mile to parking. You won’t go very far before people will start waving you down offering tours, parking, and “information.” Pass them by. Check prices for the best deals on rental cars in the area. There are two parking lots on the right (yes, you can park there). However, we suggest passing those by, going an extra 50 feet and turning into the first parking lot on your left (marked by a small guard shack and a heavy metal gate, which will be open). The prices are the same for all the parking lots (50 pesos; less than $3 for the full day), but the parking on the left has the bonus of having spots in the shade if you head to the back. The second way to get to Akumal is the colectivo. Basically, you’re on the local bus. The colectivos depart Playa del Carmen from Calle 2 Norte at Avenue 15. Look for the white vans heading in the direction of Tulum. The cost is supposed to be 35 pesos per person (less than $3), but some drivers may quote a slightly higher price. Tell the driver where you are going (“Akumal, por favor”). The driver will leave you on the side of the road at the base of footbridge. Head up the footbridge and cross over to the other side of the road. Walk down the road approximately a half-mile. You’ll know you’re in the right place because you’ll soon be accosted with offers for guided tours and life jackets. Just keep walking. The third and final way is by going with a private tour. All over Cancun and Playa del Carmen, you’ll be approached by people offering you tours to Akumal. You certainly don’t need a tour and you will pay a premium for the convenience. If you want to go the private tour route, you’ll save some cash by pre-booking your half-day snorkeling trip. Head through the gate to the Akumal snorkeling paradise! Orient yourself so you’re looking at the large white gate welcoming you to the village of Akumal. If you need any sundries and beverages, the Oxxo store on the right side is where you should stop. Head through the white gate. You are looking for the Akumal Dive Shop. The road will almost immediately fork. To the right is the Lol-Ha restaurant. Follow the main road as it goes slightly to the left. You’ll see a car park on the left. The parking here is pay-by-the-hour. We do not recommend parking here. Just past the parking lot on your right side, you’ll find the Akumal Dive Shop. Walk up the steps of the dive shop on the left side (see photo below) and head out to the beach. As of 2019, there are now gates on the left side of the dive shop and a $5 admission charge to access the beach through the dive shop. 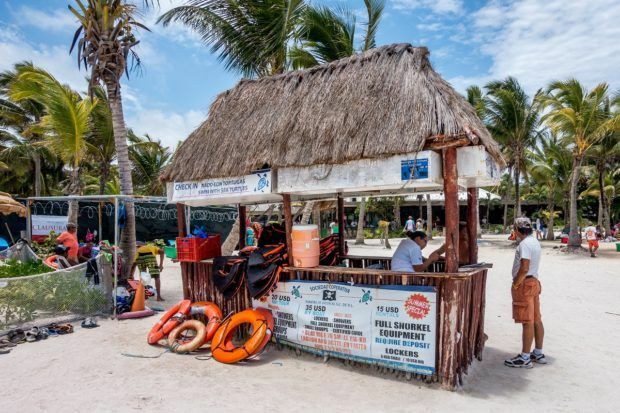 Some visitors have also reported problems with the Akumal Dive Shop, so you might consider other options. There are still some other points of entry where entrance is free. 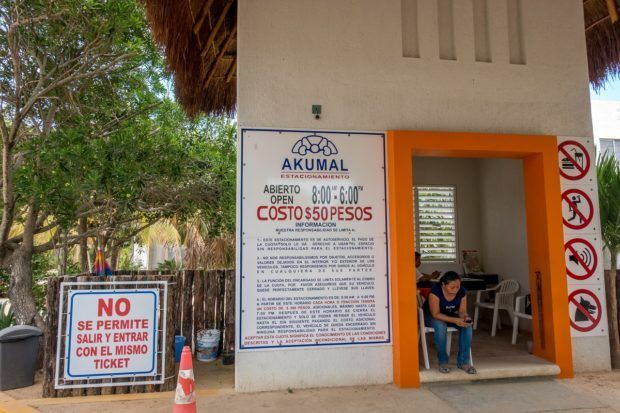 As of March 2018, entrance to Akumal beach through the CEA Center building comes at a charge of $5 USD, which includes use of restrooms, lockers, and other facilities. The beach itself is public and remains free through 14 different points of entry. We recommend leaving your gear/towels on the rocks on the left outside the dive shop. Do not bring any valuables with you! If you did not bring your own snorkel gear, you can rent it at the dive shop, which will also ensure easy access to the beach. Or you can rent from one of the many vendors with plastic tubs on the beach (going rate is $10-15 for the day). We recommend bringing your own snorkel gear. There’s something about putting your mouth on a snorkel that thousands of others have used that we don’t love. This is our favorite snorkel and mask set. If you get hungry, head to the Lol-Ha restaurant, where you can sit in comfy plastic chairs and drink the beverage of your choice while enjoying some pretty decent food. If you need a toilet, Lol-Ha has a pay toilet (5 pesos). In March 2016, Akumal Bay was declared a marine protected area. Throughout 2017 and into 2018, various guidelines were put in place ostensibly to help protect the turtles, but they have caused a lot of confusion. The Akumal scammers are taking this as an opportunity to push their agenda, threaten people, and make money. Our recommended approach is to just keep walking. If someone asks you about life jackets, don’t respond and just keep walking. If someone asks you about a tour, the same thing. Unless an individual produces a valid photo ID from PROFEPA (Procuraduría Federal de Protección al Ambiente, the Mexican Federal Attorney for Environmental Protection) they have NO legal standing. Period. They can wear any color vest they want or act as threatening as they possibly can, but they have no official or legal authority. Of course, if you are approached by actual police officers in uniform, comply with their directions. No matter what you are told at the beach by those trying to make money, snorkeling on your own in Akumal is still allowed for free—you do not have to be part of a guided tour. Entrance to the Akumal public beach is free. Wear short fins or no fins at all. If you have long fins, it is likely easiest to swim down the beach near Akumal Bay Beach and Wellness Resort. However, long fins are really unnecessary. Do not enter the buoyed areas. People report having better luck (i.e., a smoother visit) if they arrive closer to 9:00am. Authorities have begun to close the area to swimmers in September to give the reef and turtles a break. If you are snorkeling independently, stay outside the buoyed section of the bay. Look for where the ocean appears darker to find the sea grass on the bottom of the ocean floor. This is where the sea turtles feed and where you should head for the best chance of finding them. The easiest way to find turtles is to look for the small groups of other snorkelers. Where you find a group, you’ll find turtles. Be careful of the boats which leave immediately to the right of the buoys. As you head through the dive shop, you’ll see a sign with rules and a map of Akumal beach. It is worth your time to study the map for a few minutes before you head out. We’re certified scuba divers, and the very first thing you learn in diving is that you are a guest in the ocean. Do not take this for granted. Many of the Akumal turtles are endangered, and the area they swim in is their feeding area. This should be sacred for all those who love wildlife. What does this mean? First of all, keep your distance. It is best to stay at least 10 feet away, and do not hover immediately above a turtle while it is feeding. If you pay attention to the turtle’s actions, you’ll have no doubt about its behavior when it’s feeling threatened or harassed. Respond accordingly. Secondly, be very mindful of your feet. Fins aren’t necessary, but if you wear them, make sure you know what’s nearby so you’re not kicking sea grass, turtles, or other snorkelers. Also, do not stand in the sea grass, as that destroys the very reason these gorgeous animals visit Akumal. If you plan to snorkel for a long time and feel that you may need a break, bring or rent a snorkel vest or life jacket that will help you stay afloat. Thirdly, just use common sense. All of this will ensure the health of the turtles and that people can continue to snorkel Akumal for years to come. You’ll be accosted with offers for other tours (Xcaret, Tulum, etc.). You may even be offered special souvenir photos. We recommend avoiding these offers. To leave Akumal by rental car, reclaim your vehicle and head back out to the highway. Turn right for Playa del Carmen or Cancun. Cross over the highway make a left for Tulum. To leave by colectivo, walk back up the road (it’s a gentle uphill) and flag any colectivo heading your direction. The return price is the same as what you paid to get to Akumal. The problem with visiting Akumal and Tulum on the same day is one of timing. Visibility in Akumal Bay is compromised as the sandy bottom is stirred up during the morning and makes it very difficult to see the turtles at all later in the day. Theoretically, you could visit Tulum after Akumal, but there’s just one problem: heat. Tulum is very exposed. There is almost no shade at the archaeological site and it is extremely hot. Both sites should be visited first thing in the morning to have the best experience. If you absolutely must visit Akumal and Tulum on the same day, we recommend visiting the turtles of Akumal first (so you can see them) and then suffering through the heat at Tulum (bring lots of water!). 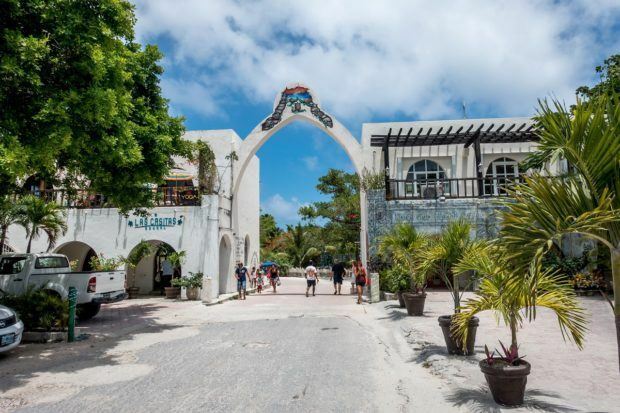 If you would prefer to take a tour to Tulum, check out this full-day tour that includes Tulum, Cobá, and a cenote visit or this half-day express tour of Tulum. One of the most common questions we get are for hotel recommendations. The biggest town in the region is Cancun and there are a ton of places to stay in the Cancun hotel zone. However, staying closer to Akumal may make for a more enjoyable, convenient experience if snorkeling with the sea turtles is at the top of your Mexico to do list. Here are some options to consider. 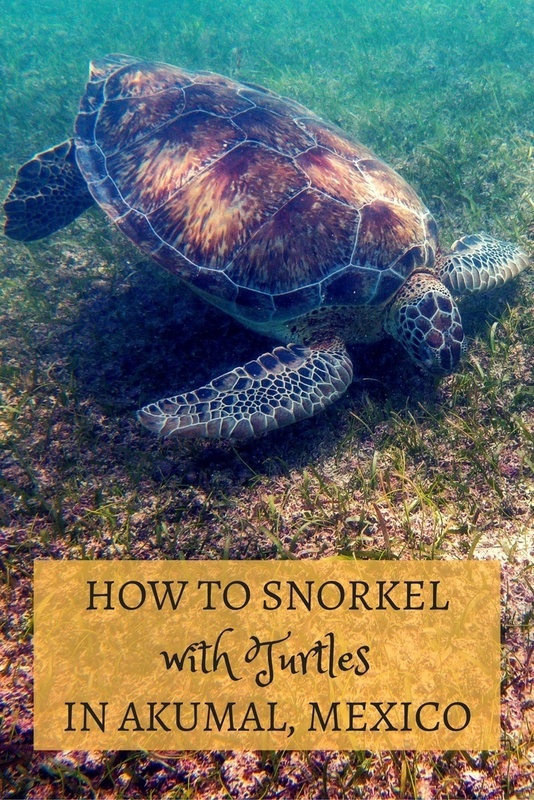 What do you think about How to Snorkel with Sea Turtles in Akumal, Mexico? Loved the detailed description of the place which makes it easy to judge if you want to go there. Is it safe for me and my 9 year old daughter to rent a car and snorkel with turtles? Do you know if there is a place to store our bag with valuables while snorkeling? Like a safety box (rent)? We have booked a hotel in Tulum and are considering visiting Akumal by taxi. Is there a reason that you didn’t mention taxi’s as a transport option? The scuba dive shop has some lockers for rent. Although, while we were there, it appeared all of them were rented out. There are a couple of options: if you have a rental car, keep valuables locked in the car. You could also theoretically pay one of the many vendors on the beach to watch some stuff. Or leave it out and take your changes. For us, we left all valuables locked in the rental car, bringing only the car key and a credit card. When we went for lunch, I actually walked back to the car and got cash, etc. No specific reason to not include taxis. In general, many of the “taxis” on the Riviera Maya tend to really just be mini-bus transfers or shared rides (vs. a true point-to-point taxi). However, I’m sure a taxi option would work. I will say, we did not see taxis queuing or waiting at Akumal for fares. So you will likely need to arrange a time for a return taxi. Hope that helps. Do you know if this is still true. Today is Mar 2 2017. All tours are suspended. But we are told it is okay to take a Taxi as individuals. Unknown. Don’t have any information more current than the Feb. 18 article. If you go, we’d love an update. Hi! Thanks so much for your advices! We did exactly what you wrote and ignored the voices behind us! We didn’t pay anything to get in! The entrance has changed. It is actually now on the other end of your red arrow. So just take the white steps and walk trough this open door! And we had a cheap lunch just getting some tacos bought near the parking! Oh parking: indeed we parked in the shadow just like you discribed it!!! I heard that swimming with the turtles is now closed. We are going at Christmas this year and want to book it, but it would be good to confirm if it is still open? We went in May, so we don’t have first-hand information about the situation now. However, the snorkeling happens from a public beach and doesn’t need to be done through a tour company. It seems that the only way it could be “closed” is if the government closed the whole beach or took some other action like that. Otherwise, you just walk up, put on your snorkel, and get in the water. Hi Dan – We found a bit more clarifying info related to your question. It seems that some regulations were put in place limiting the size of group tours because large groups get in the turtles’ way and destroy the sea grass. Not all companies complied, so some were shut down and some were fined. It’s still possible to go with companies that are operating or own your own, which is what we would recommend. Hope you get to enjoy the experience! Thank you so much. My family is very much looking forward to this. We just went today. There is a sign there now that says a guide and life jackets are requred and the beach is roped off. There are men in kayaks making sure people don’t go past the rope to see the turtles without the guide. Either there scam is very convincing or new rules. The signs that life jackets and guides are required have always been there…and have always been a scam. PROFEPA (The Federal Office of Environmental Protection in Mexico) has introduced new policies for Akumal Bay. Based on currently published information, those rules only apply to tour operators, not individuals. However, enterprising businesses are using the new rules as a chance to enhance the scam. 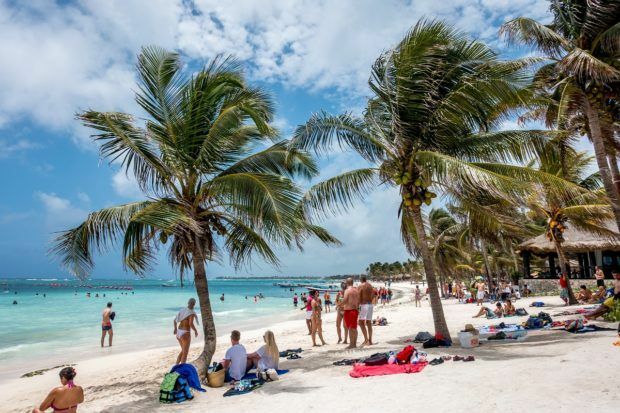 We do believe that eventually there will be a crackdown in Akumal on individual visits, however, that has not happened yet as official policy. You just saved us a bunch of money. Thank you so much! Glad we could help out Maria! Tried to snorkel todayv at Akumal Bay and was harassed by some aggressive men, claiming to be authorities. I don’t believe it because they didn’t have ID. One recorded me with a go pro the entire time. They claimed life jackets were mandatory and didn’t care where I got it. One person at the dive shop agreed with them. The lifeguard at our resort said it was not true. The excursions representative at the hotel said it was true after all. I’m very confused about what to believe, but even more so, what to do. Sorry to hear about your experience. The aggressiveness and the scams have always been part of Akumal’s history. I was able to trace down the first recorded reference on the Internet to the life jacket scam and it was in 2004 that these guys started telling people that life jackets are mandatory. They weren’t then and they aren’t now (although, still a good idea if you are not a particularly strong swimmer/snorkeler). It is a public bay. Anyone is free to swim and snorkel there without charge. There is not any requirement to go with an escorted tour nor is their any requirement to use a life jacket. I will be updating this with even stronger language and links to the official policies. Our recommendation when encountering these individuals, keep walking right past them. Thank you. Unfortunately many people, including an excursions representative from our hotel, are all telling the same story that wearing life jackets is mandatory, but none of them can substantiate it. It is very troubling since snorkeling in the bay is the only reason we came here. Intuitively, that makes sense to me. Excursions folks have a vested interest in trying to sell a package tour. The more barriers they put up, the more likely people are to book with them. Again, sorry for your experience. That kind of hassle was exactly why we wrote this article in the first place. On our trip there, we were also approached and hassled about the life jackets and pressured to sign up for a guided tour to make sure we could find the turtles. We’d be warned by a local and just passed them by, but it did prompt us to want to write this. The only official documentation available makes it clear: Akumal Bay is a public bay and a public beach; there is no charge to swim or snorkel here; life jackets are NOT mandatory (although still a good idea if you are not a strong swimmer/snorkeler); and there is no requirement to visit the site on a guided tour. Answering both questions. It is absolutely safe to go to Akumal on your own and snorkel. Renting a car and driving the main road from Cancun to Akumal is also extremely safe. It’s a wide road at least 2 lanes in each direction (sometimes 3 and sometimes 4 lanes). Drivers don’t drive crazy, there are speed bumps and several police check-points (for trucks, but it has the benefit of keeping crazy drivers in check). It’s completely safe. That said, we have not driven in Cancun proper, so can’t speak to that area. Our comments are only for the airport and points to the south. References to the official postings (in English) are included in the article above. 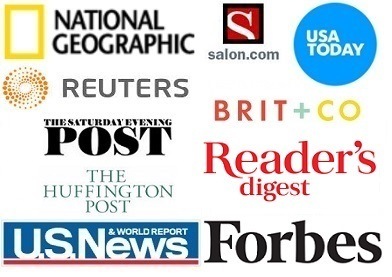 We recommend printing out our article, plus those two additional documents that we link to. 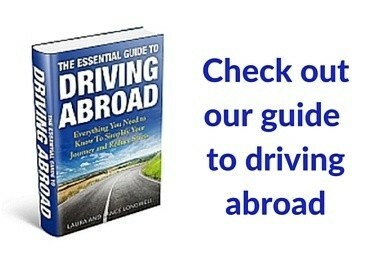 Regarding rental cars, we generally have good luck renting with big, international companies. If you ever have a problem, they’re better in service. On our last trip to Mexico, we rented with Hertz. They were a little slow in the car checkout process, but otherwise it was a good experience and we’d rent from them again. We returned the car very dirty, muddy and with lots of sand in it and they didn’t even bat an eye. Remember, U.S. insurance is not valid in Mexico and liability insurance is compulsory. Good luck! This looks so cool! Do you have any recommendations for a hotel close to Akumal? We recommend staying at a hotel in the Playa del Carmen area. We’ve stayed at the Occidental Grand Xcaret and Hacienda Tres Rios, as well as renting an apartment in Playa. I have heard rumours that people may hijack cars and attempt to kidnap us, so my concern around safety was more in regard to how a middle aged canadian woman and her daughter would be treated traveling alone. I love to be independent and teach my 9 year old the same but some people have tried to scare me and tell me that it’s a big risk to drive anywhere in Mexico. Also, how about snorkelling with turtles in the Isle of Mujeres as it seems to be closer? We have not been to Isle of Mujeres, so can’t comment. This region of Mexico is extremely safe. You should not worry at all. I drove from Cancun airport to Akumal alone with my two teenaged kids. My husband was unable to accompany us. Highway is safe and I’ve had no problems. Here now! Staying at a Vrbo condo at half moon bay. Biking to Akumal beach tomorrow. Will update here about the scammers. We are not taking valuables and I’d just as soon wear a vest to keep the scam artist away and keep afloat off the coral. Im a strong swimmer but my husband and I have snorkeled with vests all over the Caribbean to ameliorate fatigue and last longer!! Went to Akumal Beach today. No harassment whatsoever. Got there plenty early with our own gear and vests. However, due to the windy and rough conditions (red flag) it was very cloudy and visibility was poor. We went out twice and came back empty! Interestingly, while we were not approached by anyone at all, there were 4 men in military fatigues carrying automatic weapons standing sentry. I spoke to one man and asked if there was some kind of threat of danger he said no, they were part of the protection of the turtles. Seemed like overkill, but…… They were all nice enough and I heard them answer many tourists questions. May try again tomorrow, but for the rest of the day back to Half Moon Bay for lots of colorful fish.!! It should also be noted that here in Half Moon Bay there is no presence whatsoever of scam artists. We are free to walk off the Beach in front of our rental and enjoy calm, lovely snorkeling, albeit no turtle sightings as of yet! I’d stay here again for sure. I was in Akumal January 8-15, 2017. My wife and I did encounter very aggressive people in the bay, and on the beach. They claimed that life jackets are mandatory and flippers not allowed. Having been in contact with the Ecological Centre before my trip, I knew this was false. They also claimed that they were federal government representatives. None of them had Federal Government ID. One such person, wearing a “Bay Patrol” t-shirt, was filming me the entire time with a GoPro camera. After a very long and frustrating confrontation with five such men, I left to consult with the nearby dive shop. They also claimed that life jackets were mandatory, and flippers prohibited. A lifeguard at our resort (Akumal Bay Beach and Wellness Resort) said that life jackets are not mandatory, and flippers are allowed. At our front desk however the excursions representative said that as of November 2016, life jackets were mandatory for snorkeling in the bay, and flippers were prohibited. The dive shop at our hotel also told us that life jackets are mandatory, and flippers prohibited. Fortunately, they also gave us life jackets for free of charge if we returned them within an hour, and if we wanted a 24 hour rental it was only $3 USD. 4) Representatives of the federal government must wear proper ID. i) We did see representatives from PROFEPA (Procuraduria Federale de Proteccopn al Ambiente) on the beach, wearing shirts showing that they were from PROFEPA. 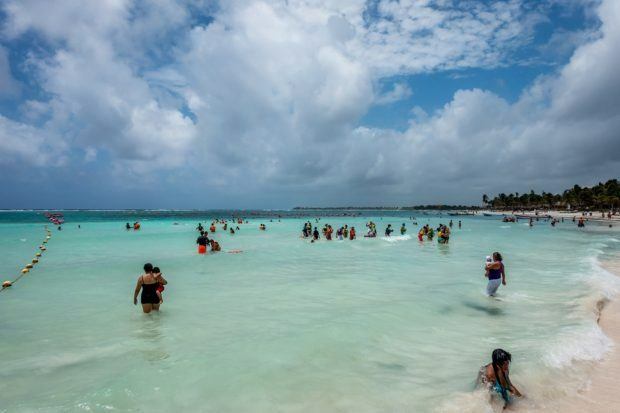 5) There are signs erected on the beach and at Akumal Bay under authority of the government agencies listing “Recommendations” for snorkelers. One such “recommendation” is that life jackets are mandatory. Tour operators will try to say that is proof that it is illegal to snorkel without a life jacket. That is false. The signs are just visual representations endorsing CONANP’s Code of Ethics for Snorkeling in Akumal Bay. 6) As of January 15, 2017, no person has any authority to enforce a life jacket requirement or flipper prohibition against any individual swimmer in the Bay. There is enforcement possible for tour operators, but not individual swimmers in the Bay. 7) This is probably the most important. While it is not MANDATORY to wear a life jacket in the Bay, the government and its agencies have taken steps, including publishing the Code of Ethics, in an effort to preserve marine life in the Bay. In my communications with CEA, they were very clear that they endorse the CONANP Code of Ethics, and while there is no legal requirement to follow the recommendations regarding life jackets and flippers, they highly recommend it for the protection of marine life. That is why after my initial confrontation with the very aggressive and clearly fraudulent individuals in the Bay, my wife and I relented and did wear a life jacket and no flippers while snorkeling in the bay. We saw lots of turtles and stingrays, and fish, and had a great time. It’s unfortunate and a bit of a hassle, but if we’re doing our part to help the marine life in the Bay, it’s well worth it. JUST DO NOT GIVE IN TO THE SCAM ARTISTS IN THE BAY! Bring your own life jackets and leave your flippers on the beach. Also, note that in the waters directly south of the Bay, there is less, if any, presence of people to try to “enforce” the life jacket and flipper recommendations. My wife and I snorkeled freely in front of Secrets Akumal without life jackets and with flippers. There are fish and coral there, but we did not see turtles. Similarly, in front of our resort (Akumal Bay Beach and Wellness) we snorkeled without life jackets and with flippers. Again, lots of coral, some beautiful HUGE rainbow parrot fish, stingrays, tropical fish etc. It’s too bad that the tour operators employ people to harass and intimidate snorkelers in the Bay, but don’t let that keep you from going. Thanks Mike. Really appreciate the trip report and current information. I wholeheartedly agree that the further away from the dive shop and the yellow buoys you get, the less hassle you have. Thanks again! This was such a helpful article and comments afterwards. We got scammed last year and paid $30 per person for a guide. It actallyy wasnt terrible as it gave us access to a changing room and they gave us a place to keep our stuff, and our guide pointed out lots of things we would not have seen, and took pics for us, but I had a feeling the entire time that we could have not paid and just done our own thing, and I hate that yucky feeling of knowing I’m getting scammed. Aside from scams and overall insecurity in this location, are there any nature preservation laws or restrictions a visitor should know about? Specifically related to turtles and how to act around them? There are no special rules in Akumal Bay. However, all visitors should follow eco-tourism principles. Snorkelers should stay off the coral reefs at the far end of the bay, don’t snorkel immediately over the top of the turtles (leaving them a place to surface), and don’t touch the turtles. There are some rules and regulations, but currently they only pertain to guides and their customers. Individuals are free to snorkel in the Bay as they please – but prepare to be harassed by the tour guides masquerading as government officials if you wear flippers and no life jacket. But in the interest of protecting the marine life, it is recommended that you follow the code of ethics for snorkeling in Akumal Bay. February 2017 and we have come across all of the scams you have warned about plus more. We were told that flippers are no longer allowed (although the Dive Shop told us that is not true). We were told that biodegradable sunscreen is mandatory – it is recommended (we use it), but it is not mandatory, yet. Local shops believe that it will be the only sunscreen they will be able to sell soon. We were also told that there were cameras taking photos of all people swimming after hours and without a guide. The cameras in question are webcams that are not very powerful and probably cannot see past the entrance of the shops, pretty sure they are for security for the shop. Thanks Stacy. To be honest, you really don’t need flippers in the bay. The turtles are used to snorkelers and don’t swim away. If flippers are ever officially banned, it won’t impact the experience. We frequently snorkel without flippers and it doesn’t diminish the experience. Biodegradable sunscreen is a smart decision. Many of eco-attractions across the Yucatan and Riviera Maya require biodegradable sunscreen, so if you spend any time in the region, you’ll probably end up buying it (or you can save some money and bring from home). Thanks for the updates! Today while snorkelling without a life jacket and flippers we got to the edge of the buoys and were told we need s guide, a life jacket and cannot use flippers. As I turned to swim away, the man grabbed my flipper and started aggressively pulling. My husband came up to us, the man swam off yelling he’ll get the police and my husband had to pull me to shore (I was out of breath after that). We got to shore and two more men came up to us saying we were going to be fined. We asked to see ID and they could not produce any. They continued to follow us. We told the lifeguard what happened and he called the police. The police came and took both our statements. They said the guys are not official but are local citizens who care about the bay. In the eyes of the police the only thing that was over the line was him pulling my flipper off. They then said the best way to avoid this is to use a life jacket and no flippers. I thought you may like that update for your blog. I loved your article and read it as a way to reminisce about our wonderful trip to Akumal. We begrudgingly returned last night. We stayed at Akumal Bay Resort and were able to borrow snorkel equipment for free from the hotel. The man working at resort dive shop/snorkel gear place informed us that jackets are mandatory to prevent people from diving down and touching the turtles. Having to never want to disturb the majestic turtles, I appreciated this rule. We saw lots of people snorkeling without jackets though, and we saw lots of fins. I got kicked a few times as tours swam through. Although we were at a resort, the town is easily accessible. We ventured in and no one bothered us or payed us much attention (though I heed by your advice, I am vigilant against scammers and refuse to make eye contact or talk to anyone who looks like they want to sell me something). I was happy to wear a jacket and preferred to keep my distance so as to not disturb the turtles. They’re not far down at all and we enjoyed watching them munch and swim up for air. We went Feb 19, 2017. We were told that the snorkeling with turtles was “suspended”, and had been since last week. This was supported by the dive shop – they wouldn’t rent gear or take anyone out for a tour (they didn’t tell us until we bought snorkel gear though). There was a huge sign on the beach and two guys beside it in military fatigues with sub-machine guns, and several government-looking people. The buoys cut us off before the water turned dark and a woman in a CONAMP shirt hanging out at the buoy line politely asked us to not swim past the buoys. There was also a strict prohibition on fins. The story seemed to be something like “to protect the turtles they are waiting until any guides are licensed to take people out”. This seemed suspicious since it was clearly never mandatory to go with a guide, but I’m not going to argue with guns! Also they never asked us for any money and there was clearly no way for people to pay money to see the turtles… So I believe it was legit. However we were still able to see turtles and rays! A few of them swam in past the buoy line. And the woman Guarding the line eventually left, and some people were seen swimming out in the dark water. Thanks for posting. There’s a lot of conflicting information right now. I just returned from a week in Tulum (2/18-2/24) and was really looking forward to seeing the turtles at Akumal. We stayed at Ana y Jose Hotel and Spa and worked with our concierge for transportation – he checked daily for access to Akumal and said it was closed by the government pending “an investigation.” Disappointed but sounds like a legit effort to preserve the area. 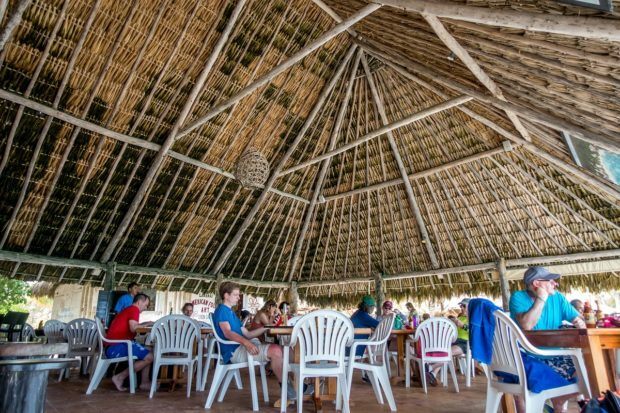 We ended up going down to Punta Allen and taking a boat ride through the lagoon and out to the ocean – saw turtles, dolphins, rays, crocs, and beautiful birds nesting. This website is helpful. It seems the suspension is still on, and trying to go is not advisable. There’s lots of other cool stuff to do. Thank you for providing the thorough information above! We decided to take a chance and went to Akumal today (March 22 2017). When we arrived, we saw the sign mentioned above but we also saw a couple of people swimming with snorkels and no guards on duty and we therefore assumed that it was all right to go in. We therefore went into the water and saw lots of turtles! However, after maybe 15 minutes or so, a woman on a kayak paddled up to us and asked us to stay within the buoys. She did not explain why though and she left immediately after, but we of course left the water after that. We went quite early in the morning (around 9) so they might enforce it more strictly later during the day. No one tried to sell us any tours or snorkels. The buoyed area does not contain any sea grass so I doubt that the turtles would hang around in there for a long time. I would not recommend to go to Akumal at this time unless you go very early in the morning and are an experienced snorkler (who will not store up the sea grass). Great post! We went today (April 11, 2017). Best place to park, great advice to enter by the dive shop it saved going by a long line of vendors. Food at Lol Ha was good. We were told the beach had been closed for 2 months. New signs posted said life jackets were recommended (not required) and fins are not allowed. We were stopped several times and told we needed life jackets and had to be part of a tour to leave the buoyed area. We went anyway. There were several guys along the buoy line. One guy blew his whistle a lot and followed us, told us to go back. It was annoying but nothing else happened. Lots of Sea Turtles, great day. My boyfriend and I went earlier this week. 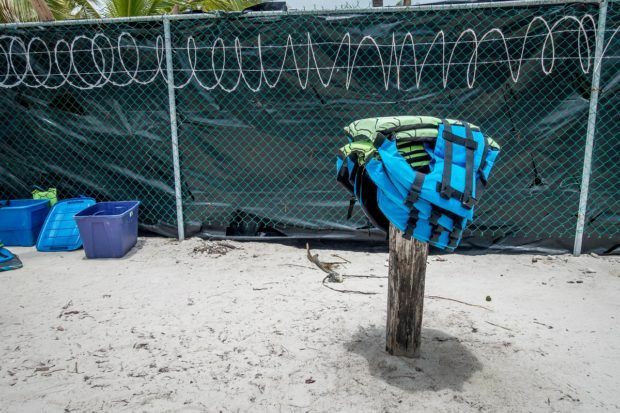 Life jackets are now required to get past the buoys to see the turtles. Beyond the second row of buoys a person from CONAMP was on a sea kayak and told us the area was protected and we could not go beyond the area without a lifejacket. Just went to Akumal from Tulum yesterday with 2 others. Thanks to the tips above it was a great day. No way do you need a tour. Got the colectivo bus to Akumal, 35 peso and then it’s a 5 min walk down to the beach. We arrived at 9 and there were a few people offering tours on the walk down, just kept walking with no hassle. Saw someone driving in who was stopped by a guy wearing an ‘info’ shirt who gave him the spiel of the rules and seemed to not let him go with buying something. At the top of the beach there a people trying to walk with you to the beach but just say you know the rules and have been there and keep walking. No stress at all. Lots of talk about life jackets on here. Because we didn’t have our own snorkels we hired them from a dive shop down there and had to get life jackets too. They said mandatory. We are good swimmers and as annoying it was to swim out with it, it made the turtle watching experience pretty relaxing to just lay on the water. They want you to wear jackets so you cant swim down underwater with them. They are super relaxed animals and showed no distress at all with us there. The tours didn’t seem to go out as far as us, we went about 100m to a big white buoy and the light blue water. We saw about 8 different size turtles. It was pretty windy but it was still really clear out we’re we were. By like midday visibility out far was only like 2 metres compared to maybe 25 in the morning. My husband and I just went here Saturday 5/13/2017. First of all thank you SO much for this information, it was by far the most helpful article I could find on snorkeling with the sea turtles. The pictures and directions are still accurate. We had a rental car so parking lot information was great, we also brought our own snorkels and masks but chose to rent vests from the dive shop just to make the experience easier, $4 USD a piece. By walking to the left towards the dive shop we were able to avoid some of the hassling by locals for tours and made it to shore no problem. We headed out towards the bouys and did experience a little harassment from someone floating in the water who told us we had to purchase a tour and that he was with the government. He actually harassed us for about 10 minutes before giving up and we tried to argue with him/ignore him/swim away…he was very persistent but eventually gave up. Very annoying but we made it through him. Sea turtles were easy to find. Look down as soon as you get to the grassy part because that’s where we saw the largest to see turtles the whole time. We continued out further towards the bouys where groups of people were and saw two babies and a mother. Also saw stingrays, and continued out to the coral where we saw many colorful fish! We hit the water about 10 AM and it was still pretty clear, but by the time we were coming back in (around 11-11:30) it had gotten far too sandy to see very well. So pleased with this experience and would DEFINITELY do it again! Thanks for the great current report Rebecca! Glad you found our guide useful – and that the information was still relevant. Trip Report May 29 2017. My wife and I went to Akumal today to do some snorkeling. Our last trip here was June 2016 – on that trip we were approached on the beach several times by guides and people offering life jackets. Once we got into the water, we were able to snorkel without harassment and we did not have life jackets. This trip was TOTALLY different. We arrived at 8:30 and were offered life vests by the Pirates of Akumal vendor on the beach. Having read recent comments, in order to avoid harassment, we rented jackets. After entering the water, we headed out to sea and within 10 minutes we were accosted by a “gentleman” wearing a pink life jacket, flippers, and carrying a swim ring. He informed us that he worked for the government and that this area was closed. I asked him for credentials and he was able to provide none. I asked him to site which law closed the area, and he simply repeated that the area was closed. I told him that the area is public and that he has no authority to harass people and then he shoved me. I told him that he could not touch me and he ripped my mask off of my face and threw my snorkel in the water and pushed me below the water (luckily I rented that life jacket). After this, my wife went back to shore. Not wanting to be bullied, I retrieved my gear and continued onward. He then kept saying that the area was closed and swam directly in front of me with his crotch in my face while pushing against my progress. After about 30 mins of this, he still had not given up, so I decided to try another approach and asked him to come onto the beach and have a talk. I did see two turtles, despite hiving the view obscured by his crotch (one of which he kicked in the head with his flippers while trying to block me). We made it to the beach and I explained to him that if he could provide some credentials and a citation of the law that said that the area was closed, I would be happy to comply. We argued some more and eventually I told him to summon the police, and he did. The police officer spoke no English, which made explaining the situation difficult. After a while of getting nowhere, the owner of Pirates of Akumal came over and translated. The police officer agreed that the mysterious guy in the pink life jacket had no authority and that we were free to snorkel wherever we liked. The pink guy then started arguing heatedly with the pirates guy and blows were about to be exchanged and the officer stepped in and separated the two. The guy in the pink finally just left the beach. After this, my wife and I were able to snorkel in peace for about 45 minutes and were able to see a couple of turtles. As we were working southward, we were approached by a woman in a yellow sea kayak who said that the area was closed. Same song and dance, I asked for ID, and she supplied a PROFEPA badge. She was much more courteous and professional than Mr. Pink. She said that the entire bay north of Secrets is closed to EVERYONE on Mondays. She also said that in order to enter the north bay on any other day, you MUST HAVE a guide. Since we were heading south anyhow and had seen some turtles, we swam the 50 feet in the direction she pointed and made everyone happy. I watched as she continually approached other snorkelers. We snorkeled another hour or so and somehow crossed a boundary that she didn’t like as we were swimming over the coral on the west side of the bay. We were going in the direction that she wanted us to, so again complied with no issues. As we were wrapping up for the day, I swam over to her Kayak and had a 15 minute circuitous conversation with her about what law had closed the bay and required the use of guides. Her position was that no one could enter the bay north of Secrets without a guide. I told her that I believed this to be incorrect and that the only references to closures that I could find are in relation to guides and these DO NOT apply to private individuals. I asked her to provide the law, or even a webpage that stated these regulations, and she could not. She referred me to her “friends with PROFEPA” on the beach. We also talked about my earlier encounter with Mr. Pink and she said that he is not with the government and had no right to assault me and that she would report it. The release does list many requirements that are to be followed by guides but does not say anything about individuals being required to have a guide to enter the area. So, as of today 29/05/2017, based upon my experiences, while it may be technically legal for individuals to snorkel freely in North Akumal Bay, expect to be harassed by multiple persons, some of whom may be violent. Thanks Justin. This seems to be a highly fluid situation. We appreciate your trip report! I am sitting on the beach at Akumal right now, having been told repeatedly that I am not permitted to snorkel without a guide. I’m pleased I found this article, and will try again now! Dear Lance and others, thank you for your information. 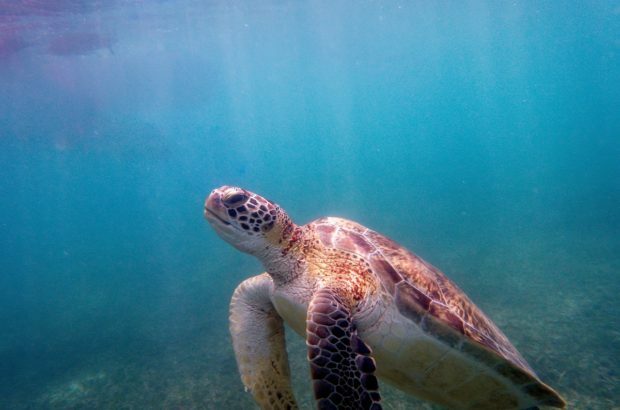 We had the uppertunity to snorkel 3 times during our visit-day with this amazing turltes. They don’t seemed to be bothered by our presence. They graze just 1,5m below you and go to the surface with 1 meter of us to take some fresh air. We are a family of 5 (2 adults with 3 teeange kids). We did a lot of snorkeling in the past so we are very experienced and we are can swim very good. We never use fins because we know this things can damage coral very quick. We are traveling for one year and deal a lot of times with (wannebee) guides in tourist areas. We experienced very hostile guides during our 3 times snorkel trips. During our walk to the public beach we were almost pushed to the information boards. We try-ed to avoid the guides which was almost impossible. The dive shop entrance was closed so we had no other option. Once on the beach we saw no guides. On our first snorkeltrip the kids went in 10 minutes before us. When we arrived one of them was replacing his head mask. Our kid said that a man (guide) in the water had hit him on the mask. When we looked around there was a man in the water that was yelling to us that we needed a live vest. Mum was furious on this man because he had touched our kid. We had a very furious talk with this man. He was floating on a live bouyo and had one in his hand. He used it to push us away. When we said don’t touch us and never touch our children any more he said that he only used his bouyo and never touched our child (ren). He kept repeating -go back, life vest is obligated beyond the line-. We repeated a few time that for individual snorkelers it is not necessay. Then we treid to ignore him. This was difficult because he roamed around us and repeated his statement in our ears. Also push his bouyo against us time after time. We had a wonderful time with atleast 8 or more grazing turtles. So incredible…after one hour or so we went back. The second time there was an other older guide. Which was a little bit friendlier or he was not a so good swimmer. Dad stated we don’t need a guide, we don’t need a life vest, we don’t need a permit. We only need that you leave us alone. He hovered around us but let us do our thing. We had again a super time with the turtles. We saw that guids were hitting the grazing turtles with their vins. Also tourist with their guides touching the turtles. Etc.. The thirth time was the worst time. We met 2 guides in the water. This were very young and powerfull man. The kept screaming to us and pushing us hard with their bouyo’s. They went especially after our youngst kid (12 year). He’s a strong boy and was not affraid or these guys. We almost had a fight in the ocean with these guides. We told them not to touch us and not to touch our children. Every time they repeated that we need to go back for the live vests. Also that the not touch is but they pointed to their bouyo’s. They told us that the go to the police. We said again and again. Please get the police hear because we are individual snorkelers. When tried to swim to the reef the became extra hostile. Again especially to our children. Push, yelling, etc, etc… We treid to ignore them every time. Which is very difficult because every time they bump into you. Again we had a great time with the turltes. Again we saw guides hitting the turtles with thear fins. We had the idea that they try to lead you of from the snorkeling and trying to make you a unconfortable as possible. In the hope you go away. We had the idea that they left us alone when we swim away from the line. More to the right. There are no turtles there. Once we snorkeled back they start chasing us again and again. After one our we went back to warm up on the beach again. 2 Girls went just in the water. They start chasing this girls. We told the girls that they were free to go anywere beacause they are individual snorkelers. The guides went now very rude and followed us on the beach. After 5 minutes we were surrounded by 6 of the including a municipal police. This policeman was not very convincing and was only watching on his telephone. Again the complete story of fins, livevests, guides, nature reserve, proecting envonment, etc. Nobody showed us an ID or other card. It al felt like a soap. Again we stated that we are individual snorkelers and we don’t need anything. Then we said to the policeman (?) that the guides touched our under aged childeren. We said to him that this was not allowed in Mexico and if he could take appropiate action. The guides were pointing to their buoys. Then like a wind they disappaired al. The last one said if we do it againi we go to jail. We told him that he should go to jail because he touched young childeren. Every body around us on the beach have been listening. One of our neigbours went to the official tienda and rented 5 live vests just te be sure. Once in the water behiind the line they were stopped and told that this was guides area only. Anyway…it seems all part of the circus protecting their business. Making individuals it almost impossible to snorkel around. Getting almost violent the further you snorkel to the reef. We had a really really nice time under water. So just go and enjoy the lovely turtles. Just be prepaired. Try to go in the water about 50m right of the line and then jump back to the grassy fields. If you are in a group spread out as far as possible so that not every body get a guide behind him. If you are an individual try to snorkel if guides are busy chasing orhers. Sorry for my bad English :-). If you need more info just let me know. Again…enjoy the turtles now they are still there. The guides take too much people in the water and let the tourist touch the animals. We were in akumal in June to swim with the turtles. A man floating on a buoy tried to turn us away. We ignored him and just enjoyed ourselves. We never responded to his threats and just continued to swim. These people are trying to make a living off the “rich” tourists. It must work or they would stop. He even tried several languages on us to no avail. It was kind of nice to have him follow my son and myself as we swam and enjoyed the fish and turtles. He never touched us but told us we must be in a tour to swim with the turtles. Don’t be intimidated, just smile and keep swimming. The turtles are amazing and much larger than I imagined. Worth the effort. So glad to hear you had a (mostly) good experience. Thanks for the update. My husband and I just returned from a 10-day stay in Half Moon Bay (a semi-private beach with condos), which is just up the road from Akumal Bay. Sadly, we only visited Akumal Bay once during our trip because the “tour companies” were so aggressive. We did not want to rent life jackets and brought our own snorkel masks. 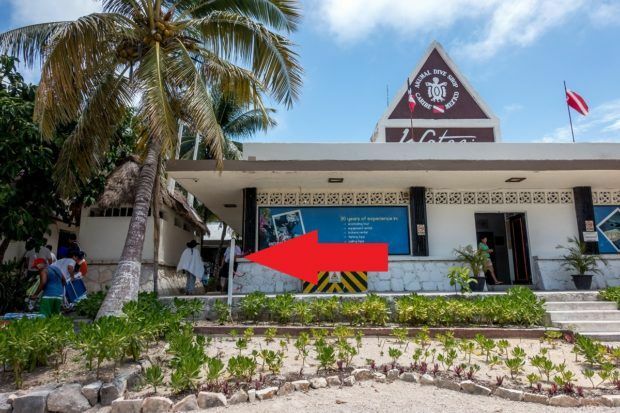 We tried entering the beach through the dive shop as this article suggested, but the dive shop seems to have installed turnstiles and had security guards posted at the entrance who told us we needed to use the public entrance. The tour scammers used their personal cars to block off the public entrance area, forcing us to walk in very close proximity to them while they gave us a hard sell on equipment rental and tour booking. We ignored them but were harassed for close to an hour by “officials” (more like teenagers employed by the so-called tour companies) who followed us in the water, filmed us with Go Pros, kicking the sea turtles while trying to block them from our view, and finally tried to grab us and forcibly remove us from the water (while they were on flotation rings). This final action made us feel very unsafe and we decided not to come back. They claimed their harassment was justified because we were breaking the rules by not wearing lifejackets, but they couldn’t name any specific law we had broken or even confirm that lifejackets are actually required by law. I saw them using similar harassment techniques on a family with small children, all of whom were wearing lifejackets (but were not with a tour guide). If swimming with the turtles in Akumal Bay is something you simply must do, I would recommend staying in the little beachfront hotel that sits right on the bay for a night or two and then going out very early in the morning before the hordes of people and tour scammers are in full swing. That way you can get info from the hotel operators, rent your lifejacket through them, and access the beach without having to pass through a gauntlet of aggressive scammers. Thanks for your recent trip report. We are increasingly concerned by the increase in violence by tour operators against tourists. It’s only a matter of time before there is a drowning due to the hostile actions by tour operators. just to give you a quick a update on the current situation. We were really nervous after reading all of these comments and were considering to cancel our trip to Akumal. Eventually we gave it a try and we were positively surprised. We parked at the carpark mentioned in the article above, which was totally fine. We rented snorkeling gear for a 150 pesos p.p, including a lifevest from the Akumal Dive Shop. According to the people working there, the lifevest was mandatory but I think it is mandatory for their insurance policy. I double checked on the beach on a sign form PROFEDA which listed a couple of rules such as no fins, no sunscreen in the water etc. but it did not list lifevests. Overall we were quite happy to wear the vests as the sea was quite rough that day and it was easier to observe the turtles. We arrived rather early (9am) and I strongly recommend to come early. We left the beach at around 11 am and by that time, there were big crowds of people (all wearing lifevests hahah) in the water and way more locals trying to sell tours or snorkeling gear, especially at the entrance of the beach. However we didn’t see any tourguides in the water, nor did we hear of anyone beeing harassed by them. Observing the turtles was beautiful and we even saw a stingray. Please make sure that you read through the guidlines on how to snorkel through this bay as I did see a couple of people who were not behaving appropiately. Thanks for the update. Maybe I should really give this trip a try and swim with the turtles. I think these guides are trying to intimidate the tourists and that’s the sad part. I’ll just try to ignore them and snorkel with the turtles. Why can’t the police or military guards be on the beach to prevent this type of scam? This makes me really mad cause I have not yet encountered awful Mexicans. Makes me really not want to visit Akumal or I will just get furious. Akumal is such a magical place, but it is also a place where real ugliness comes out. There has already been one near-drowning because of the current situation there. It is only a matter of time before someone is killed. Looking for updated info on this… anyone? The last update is from October 1 (above). It does seem to be a highly fluid situation at Akumal Bay. If I were going to Mexico, I’d probably go out to the bay and try it following the underlying advice: ignore the scammers. I’d probably do the life vest to minimize problems. Thank you for the detailed info and string of replies. Very informative. We are planning a trip to Akumal from our location in Cozumel in next two weeks. Apparently the rules for swimming with the turtles had changed as of May1 2017. I can appreciate the rules on lifejackets and no fins. Guides seems to be a money thing but makes sense to better control the number of people in the water and restricting the areas that can be snorkeled in for the betterment of the turtles. We await our experiences in the next two weeks. I was at Akumal yesterday. The beach was very nice and people were friendly. The vibe is a nice mix of tourists from all over the globe. We could not snorkel from the beach with turtles however since the ENTIRE TURTLE ZONE IS CLOSED OFF TO SWIMMERS FOR THE MONTH OF FEBRUARY 2018, boat trips might be an option however. Hi, we were at Akumal on Feb 16 and while the turtle zone is closed to TOURS for all of February, individuals can swim in certain areas. There is a confusing array of buoys to indicate swimming and boat channels, but we just looked for other snorkellers and for the darker areas of the water which are sea grass areas. We were in the water for about an hour and saw 2 turtles. I was expecting to see more, but it was still a lovely experience. We proceeded to the Akumal Dive Shop, where we got very helpful info about tours not being permitted, individual swimming, and confirmation about no lifejackets required (I rented one on the beach because I’m not a strong swimmer). We rented a locker and went on to enjoy the day. We got in the water around 10:30 am. I would recommend arriving not later than that. The beach got more crowded and there were more people in the water as the morning went on. I’m sure that we lucked out with the tours being suspended. For another snorkelling experience, head down the road (about 30 min walk) to Yul Ka lagoon. It’s not a turtle habitat but lots of fish in clear water and since it’s a lagoon, it’s very calm. That’s so helpful, Lee. Thanks for taking the time to provide a trip report. As you have seen, so much of the challenge comes in not being able to rely on what’s “official.” It’s great to know that the dive shop continues to be a good source of information. It seems that your experience may have been better than average due to tours being suspended, but we’ll keep our fingers crossed that the tide will turn re: some of the harassment. Awesome article, very much appreciated! I was curious why the recommendation of no long fins? Are there sea turtles in the area near the Akumal Bay Beach and Wellness Resort? Long fins disturb the seagrass, have a tendency to make the visibility poor, and may accidentally kick sea turtles. There are generally turtles throughout the bay. Just got back from Mexico and wanted to say thanks very much for writing this detailed article, it answered all our questions about going to Akumal and really put our minds at ease! Great! How is the situation at Akumal Bay these days? Did you have any problems or harassment? I’m out in Mexico now and would like to go back to Akumel to snorkel independently. Is it still possible to do so from walking in from the shore? Is the water generally clear with good visibility for snorkelling or quite murky because of the seaweed? Any ideas how I can find out what the taxi fare would be from the Royalton Riviera Hotel in Quintana Roo? Are you aware of any local turtle sanctuaries where I can volunteer for a day? Yes, you can still walk in and snorkel independently as always. Reports are that the seaweed situation has improved substantially as currents have shifted, but we’d love to hear an updated report if you end up going to Akumal. Your hotel would probably be the best source of information for a taxi estimate. From the original post i can a lot of these comments where 2016/17. I am sure it was once a beautiful place, sadly it has been ruined by Greed. Humans Greedy for money. Its so sad. Looking at pictures of how Akumal Beach looked it was an unspoilt paradise. Akumal Bay, a small private bay where you can get close ( but not touch ) turtles and swim near them in their natural environment. What Akumal beach now has become is a tourist spot with FAR too many tour groups going out into the water looking for turtles, that coupled with lots of locals ( and tourists ) just bathing on the beach and swimming in the shallow water, made this one of the saddest experiences i have had. Yes we seen a Turtle but not how we wanted too, taken out into the ocean into a boat, someone would shout TURLTE then at least 50 people would swim over each other in choppy water to get the best view. If you where not a confident swimmer or a child this would be terrible. So sad that Human greed has ruined what was obviously a beauty spot. And a paradise for the Turtles. Now filled with petrol fumes from many speed boats and hundreds of tourists trying to look at the turtles. I was just in Akumal bay January 2019 and read this article first before going to the beach. I went into the dive shop in the description and maybe since I was with 3 others, they asked us not to enter the beach in through here as it wasn’t a public access. So we had to pay the $5 to get in. Again lots of harassment everywhere to buy a guided tour. I tried arguing but saw it was going nowhere. Since my friends and I had our own snorkeling equipment I was able to talk them down from $30 to $20 (400 pesos) for the guided tour. Honestly that’s the way to go cause it’s not worth the harassment. But we did an hour snorkeling and didn’t see a single turtle on the first loop. Though we saw two sting rays. Went to the second loop and saw two turtles not too far at all from the beach. There were several people trying to snorkel without tour and life jackets and they were constantly being harassed in the water by a guy in a kayak and other people asking them to leave, but me and my friends were totally fine since we had a guide. I don’t think this place is even worth the effort of coming. You can see turtles in several other places. Anyone who dives or has ever done a fair amount of snorkeling won’t be impressed at all by a couple of turtles. This is a tourist trap and I will never come back nor recommend anyone to ever come here. Stay far away. It sounds like the place has really changed…even in the last 8 months. Unfortunately, Akumal 2019 is very different than it used to be. We’ll be revisiting and updating this article accordingly. Thanks for sharing your experience. Similar experience for me. Followed the directions exactly. Everyone at the dive shop said we had to pay $5 US (in pesos). We ignored this and followed the red arrow as in the photo and the guy there shut the gate on us so we were physically restricted from entering. We are fluent in Spanish and no amount of conversing would get us through. We ended up paying the 5 bucks. Arrived right at the start of the day and swam continuously in the 2 areas non-guided folks are able to swim. Saw some big schools of fish but no turtles at all. The beach itself was very beautiful but at least in my case, for all the hassle and the lack of turtles, I’d rather just go to some other beach in the area. My wife and I just came back from Mexico, we have been going there every year. Akumal has changed a lot, and sadly we won’t be going back. In the past it has been a public beach, easy to get into and snorkel. You now have to pay to get I to the beach, you can get through the dive shop, or go further down the road and find a private driveway and locals will charge you have the price. You can only use a small section of the beach, which you cant see any turtles. We were talking with the locals that live on the beach who were not trying to sell us anything. Government has stepped in and only allow so many tour groups inside areas, and you can’t go in them on your own. It is really too bad as this was a great place to snorkel, but with the high traffic the feeding grounds were being destroyed by humans. You would get people who have no respect for turtles or their home. If your planning on going, expect to pay 5 dollars to get in, and then around 35 to 40 for a tour. If you have never been it is a good experience to see turtles. We just like to do it at our own pace and not be in huge groups. It is still way cheaper to find your own way down there than buy it through the resort. If you have been to Akumal before in the past, you will be disappointed of what it has became. We were there last week at the diving shop, but there are gates and we had to pay 5 dollars each.. Just to give you an update. Thanks Nicole. We’ll update the article. Thank you for the detailed information. We went this morning (arrived at 8:45 am), and I had used this page as reference for how to avoid being scammed. Even before passing through the white arch, we were approached by many as you had warned, insisting that we needed a guide to enter the water. I said no thank you and kept walking, but after passing the arch I stopped at a small stand & bought my son and I each a life vest because I thought it would make observing the turtles easier. They were 100 pesos each, and required an ID deposit, but I’d left my ID in the car so they let me leave my car keys (he’d said I could leave 200 extra pesos as cash deposit, but I chose the key option because I needed that cash for entering the beach). As soon as I approached the area to the left of the dive shop, a guy pointed me to the ticket booth to pay the $5 USD or 100 pesos each to pass through. I didn’t want to take the time to try to find a free place to enter through, so just paid the 200 pesos for my son and I. The guy then tried to explain that there were 3 zones in the beach, and that the only one we were allowed in was the first, and that there is sadly “nothing there to see.” He insisted that we needed the guide, and that going past the buoys was not allowed without a guide. I told him thats ok I have friends who have gone without a guide (which wasn’t a lie, my friends came in January), and so he left me alone. I did see guys on kayaks in the water, seemingly ready to tell anyone without a guide to turn around. I searched the “first zone” (left side) first, for 30 minutes, and saw nothing. It was a bit of a windy day, and I was afraid I wouldn’t see anything. I passed the “second zone” (I’m assuming the zones were what the buoy lines sectioned apart), and walked on to the third zone, where I saw a few people freely snorkeling without a guide. I went into this area, and after only 10 minutes, I heard a man (who appeared to be the guide of a small group) telling them a turtle was down below. Sure enough, it was. And then another one was spotted later nearby, and lots of single and small groups of snorkelers were able to enjoy watching the turtles feed and occasionally swim to the surface for air. I should specify that this was not past the buoys that they were spotted, but close to the shoreline). We all gave the turtles their space, and they didn’t seem to mind our presence. So yes it is possible to spot some on a fairly windy day in late March, but expect to pay at least $5 or 100 pesos entrance fee unless you can find a free entry point. And don’t give up if you don’t see one for the first 45 minutes! Enjoy the fish while snorkeling until a turtle is found.